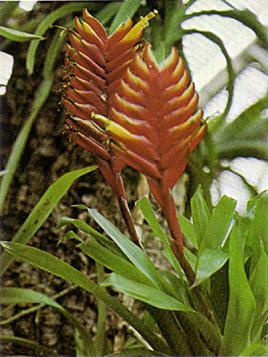 Vriesea carinata hybrid by Walter Richter, photo taken by him in his greenhouse. Compared to other cultivated plants, bromeliads are rather latecomers, and I am optimistic that they have very good chances for a great future. I mentioned my optimism 15 years ago when I selected the title of my book on bromeliads: Bromelien—Zimmerpflanzen von Heute und Morgen. [Bromeliads—Indoor Plants of Today and Tomorrow]. The development of the Bromeliaceae and their distribution in this short period of time have not only confirmed my theory but excelled all expectations. Besides the natural longevity of these plants, we have also developed means to control and direct the flowering periods, which, even more, has contributed a great deal to the worldwide popularity of bromeliads. More and more discoveries of new species and new methods to grow and breed these plants have contributed to larger assortments at nurseries to the benefit of collectors and fanciers. As mentioned above, we now have the ability to control the time when a certain plant should bloom and also how early it can be forced into inflorescence. This means a considerable reduction in the time it takes to mature a plant, a matter which can be of economical value to the nurseryman. It is now possible to get bromeliads to flower when they have reached only half their normal size; this brings not only the price down but also saves space for the grower and the buyer. During the past decade I have concentrated on working with guzmanias, neoregelias, vrieseas, and to a lesser degree with cryptanthus. Within the genus Aechmea I have worked mainly with A. fasciata, focusing on durability and selecting "early bloomers," to establish clones of rapid development. But I still keep an eye on possible combinations within this large genus. Particular progress has been made with guzmanias. The registered hybrid ORC 'Rio', a cross between G. lingulata var. minor (orange) and G. lingulata var. minor (red) shows stronger growth than does G. lingulata minor (orange) and has intensely red colored flower stems. Other hybrids, still unnamed, were developed by hybridizing different clones of G. lingulata var. cardinalis, resulting in medium-large growth with extremely large inflorescences in yellow to red-orange flowers. After intensive work with the genus Neoregelia, we were rather successful in developing a number of miniature hybrids, which are very much in favor for indoor use in small rooms. The cross Neoregelia ORC 'Montevideo' and N. × marechalii minor is a good example, as both plants have a small circumference and the central leaves are strong in shades of red to red-orange. N. ORC 'Feuerland', which resulted by crossing N. carolinae × N. chlorosticta, has red and green marbled center leaves, a color combination which becomes intensified when the plant is grown in strong light. The size of the mature plant has also been much reduced. Other hybrids are presently in preparation. The genus Vriesea demonstrates quite a complex field for experimentation. V. splendens 'Flammendes Schwert' (Flaming Sword) in miniature size and V. splendens 'Fascination' with vivid red-brown banding along the leaves are just two examples of our work in trying to propagate these characteristics true to form and color. Another interesting cross was made by crossing V. glutinosa and V. splendens 'Flammendes Schwert' resulting in V. ORC 'Brasilia'. This plant produces tremendous growth with multibranched inflorescence that is 1½ meters high of an intense color. It makes a perfectly stunning show plant. The hybrids of green leaved vrieseas are especially numerous. We used the old standbys, such as V. × Poelmannii, F. × Vigeri, and others as parents. During the last few years we have worked hard to produce small plants with relatively large inflorescences, branched or single, and of intense coloration. We feel that we have succeeded in this endeavor and in producing medium-large as well as very large plants, with extremely outstanding flower spikes. But besides the number of fine new crosses there have also been a number of difficulties and sometimes failures. We have not yet succeeded in hybridizing V. rodigasiana, as its inflorescence is so completely different from that of the average vriesea. The same is true with V. malzinei, which has brought only unsatisfactory results. The Como Park Conservatory in Saint Paul, Minnesota, draws thousands of visitors annually from the five surrounding states here in the Midwest. Our facility, built during the Victorian period of the late 19th and early 20th centuries features an iron and steel truss construction. 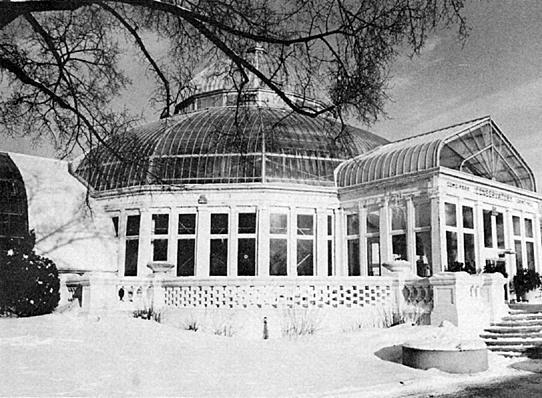 The conservatory consists of a 65-foot tall dome or palm house, economic house, fern house, sunken gardens, plus eight back growing houses. Recently, because of the increased interest in bromeliads, a section of the dome was redesigned for a bromeliad display. Although it may not be as large as some botanical gardens that have an entire house for bromeliads alone, our bromeliad display provides our visitors with an insight into how these plants thrive in their native habitats. The display project took approximately two weeks to complete. To begin with, most of the original tropical plants in a quadrant of the dome were removed and potted or planted elsewhere. A background of decaying logs was attached to the existing redwood framework that hides our steam pipes. Next, the entire soil area was treated with Nemagon as a preventative treatment. Then, the city forester had the city tree trimmers carefully remove a large limb from an older bur oak in the park dump area. At the conservatory, the individual limbs were tagged and removed. Once moved into the dome, the oak was reassembled with steel spikes according to the tag markings. In this way, one cannot tell that the limbs were ever removed. The base of the branches was cemented in the ground against the log background. After allowing the cement to set for a few days, other "props" were added. One-half ton of lava rock was obtained and along with sterilized soil, various mounded areas were created in front of the oak "trees". Then, a truckload of driftwood was harvested from the city's Crosby Park and worked into the conservatory display. Once all the props were in place, the massive job of planting began. Our plants were obtained from a number of sources. An exotic grouping of bromeliads had been ordered earlier in January from Paul P. Lowe in Goulds, Florida, and were potted and growing in the back growing houses. Then in September, Fritz Kubisch in Culver City, California, sent us a large order of tillandsias and a few other genera. In addition, we have done some swapping and trading with the Horticultural Science Department at the University of Minnesota and a few other bromeliad contacts here in the state. This has resulted in a collection of forty known species split up among fourteen genera. In addition, there are many species that were formerly planted elsewhere in the conservatory and over the years their identity labels have disappeared. Once flowered though, we should have them properly identified. Little by little we plan to expand our genera as contributions arrive. But until then, we have a good starter collection that has many of the species grouped and labeled to genera and habitat. Although this garden display has been completed for only a short time, the admiration it has already drawn from our visitors proves that the bromeliads will continue to be an educational and therapeutic exhibit for years to come. We invite the members of the Bromeliad Society to tour our conservatory when visiting our fair city. Como Park Conservatory is open every day of the year and there is no admission charge. Our summer hours are 10 A.M. to 8 P.M. and winter hours (Labor Day through Memorial Day) are 10 A.M. to 4 P.M. THE NATIONAL SCIENCE FOUNDATION has announced monetary support for a study "Floristic Survey of Amazonian Peru" to be conducted during the next two years. Amazonian Peru, roughly the size of Texas, is a very rich lowland tropical area. It is poorly known botanically (it is the home of Aechmea chantinii), and the main object of the project is to collect and identify plant specimens and catalog the species of this region, important segments of which are being rapidly destroyed. A second goal is completion of the Flora of Peru. Headquarters is Iquitos. On Sunday afternoon March 14, 1976, I visited the work of a lifetime and came away awed by the enormity of it all. It was the beautiful garden of Mulford and Racine Foster near Orlando, Florida. One of the first plants to command attention is Vriesea imperialis, not only because of its sheer size but also because of its great beauty. Several of these giants were found on the grounds. Neoregelias, however, dominate the setting because Mr. Foster spent much time hybridizing in this genus. His aechmea hybrids ('Royal Wine,' 'Foster's Favorite', and 'Burgundy' to name just a few) were everywhere. In my seven months of collecting bromeliads I've never been a more avid hobbiest than when I left the gardens. Visions of Portea petropolitana, Dyckia fosteriana, Puya humilis, Hechtia podantha, encholiriodes and the rare Encholirium itself were all in various stages of bloom. There are so many plants that it is hard to remember them all, so please pardon me if I make a slip. The quesnelias [humilis, testudo, and quesneliana] were present and never in finer shape than in this "natural forest" created by the Fosters and acclimatized by the plants themselves. Cycads, crinums, staghorns, azaleas, camelias, amaryllis, a thousand feet of Raphis palm fence, and hundreds of native oaks combine to provide the natural conditions that these plants want. Also the well-drained sandy soil and natural shade stimulate the bromeliads to achieve their natural perfection. 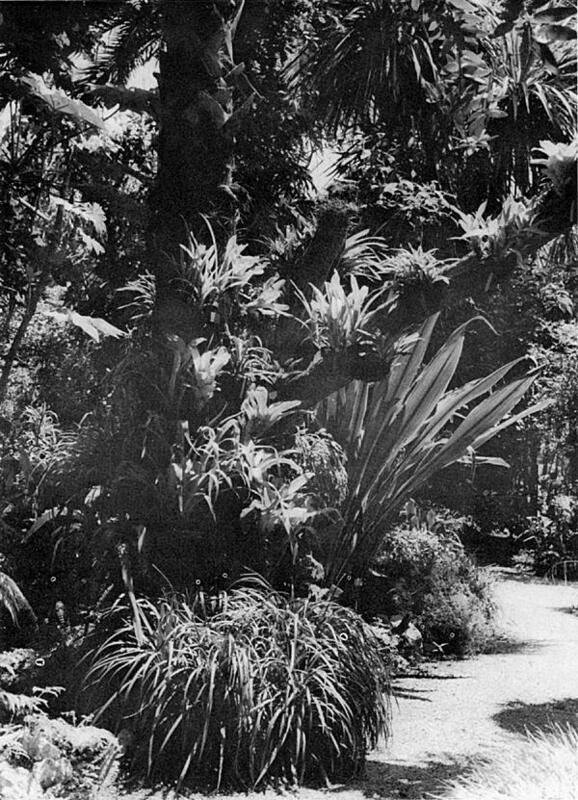 Mrs. Foster spoke of the six years it took to plant the grounds prior to building the house and the thousands of bromeliads Mr. Foster planted by hand. The greenhouse appears to have suffered only slight neglect in the two years since Mr. Foster's decline in health, which, by the way, was not in evidence as Mr. Foster sat and chatted with the members of the Bromeliad Society of Central Florida, of which I am a recent addition. As he sat there joking and storytelling as always, the weight of years and of fame seemed to rest lightly on Mulford Foster. On the walks once more, I saw more varieties of Aechmea distichantha than I knew existed. Other bromeliads growing happily in a natural setting were Aechmea calyculata, A. caudata, A. chlorophylla, A. victoriana, A. weilbachii, A. lamarchei, Billbergia fosteriana, B. pyramidalis, Orthophytum vagans, O. fosterianum, Neoregelia fosteriana, N. concentrica, Hohenbergia ridleyi, and many, many more, but the list must stop. 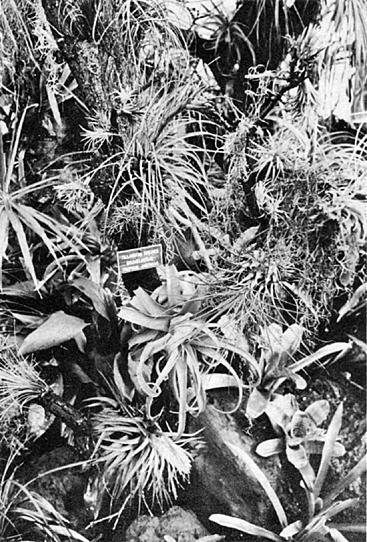 Undoubtedly, the high point was Andrea selloana pointed out by Mrs. Foster as possibly the only specimen in cultivation. — One of the California nurseries has described the miniata × weilbachii hyb. 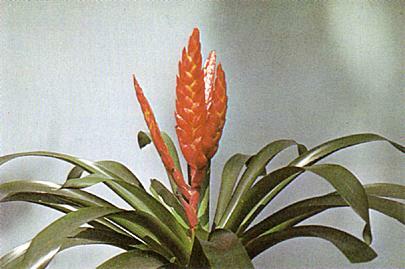 aechmea (Presumably m. discolor and w. leodiensis) as particularly cold-resistant. The 1975-1976 winter has been our coldest since we've had this plant, with temperatures repeatedly in the 40's and 30's, though locally not down to freezing: and experience here does not bear out the claim. There have been several frosts; but as most of the bromeliads have overhead protection, this is probably not a significant factor. In a planting of Aechmeas 'Foster's Favorite', 'Maginali,' miniata discolor, victoriana discolor, dealbata, and miniata × weilbachii, only the last, and most of them, had leaf damage. "Particularly tender" would appear to be a better description. PLEASE NOTE — The cover picture on the March-April issue for this year was misnamed. It should have been Aechmea aquilega instead of mulfordii. Laurel District. The greater portion of this area is jungle. Rainfall is common; about 1,785 mm. throughout the year. 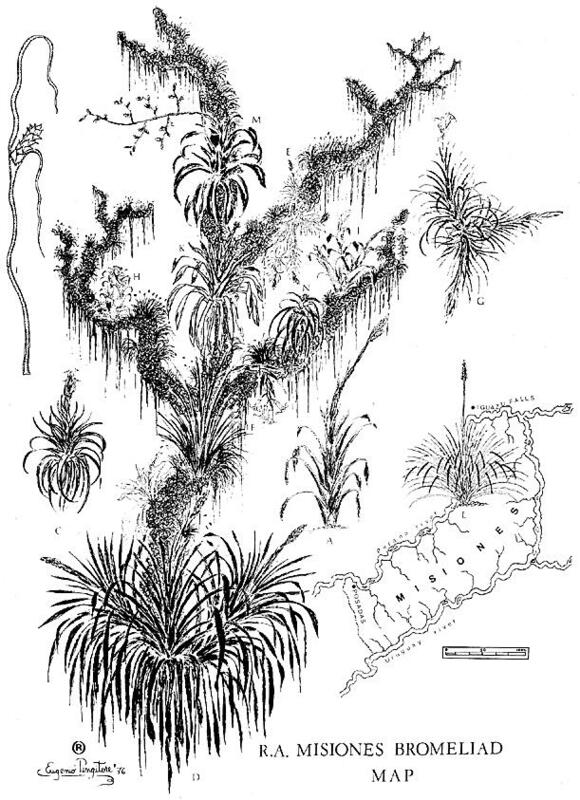 Bromelia balansae, Pseudananas macrodontes, and Dyckia mitis are to be found here. The Tabebuia ipe trees are gracefully covered by Tillandsia usneoides var. cretacea and Tillandsia pulchella var. vaginata. Rose Tree District. This area lies inside the world-famous Iguazu Falls National Park in the northwestern part of the province. In this great green world, the traveler can enjoy the perfect well balanced rain forest life style, among mosses, ferns, and orchids (Oncidium, Gomezia, Miltonia, etc.) Here grown Aechmea calyculata and A. bromeliifolia, Tillandsia pulchella, Vriesea platynema, and Acanthostachys strobilacea. In high trees live communities of Billbergia nutans and B. zebrina. Tree Fern Lands. This area is a high, humid spot in the central hills of Misiones. The climate is extremely damp and the section abounds in tree ferns, such as Nephelea setosa, Dicksonia sellowiana, Nephelea plagiopteris and N. procera. The trunks of these spectacular tree ferns are covered by Tillandsia streptocarpa, T. geminiflora, Vriesea platynema, V. tucumanensis, Aechmea calyculata and A. distichantha. Riverside Area. This is the jungle area that is found along the Uruguay River and lakes. The warm humid temperature makes possible the existence of many charming orchids such as Oncidium pulvinatum. The trees and shrubs are covered with Aechmea recurvata var. recurvata, and A. distichantha. Pseudananas macrodontes is also found here. Campos Area. This is an inclement section situated in the southern part of the province. The place is not comfortable for human life because of the high temperatures during the summertime, as well as the daily rainfall, and the freezes of winter. This is a barren region in which there are few trees. Growing here is the rare palm Butia paraguanyensis. The only bromeliad to be found is Dyckia mitis. MY FIRST BROMELIAD — I've been collecting bromeliads for approximately three years now, but I bought my first bromeliad four years ago, not knowing what it was. I soon became attached to this plant. In three months the plant bloomed: it had pink bracts and delicate purple flowers. And in a few days to my amazement it produced pups. I was so thoroughly delighted I took pictures. One day I walked past a plant store and thought to myself that perhaps I could find out the name of this plant. I happened to have a picture in my wallet. I walked into the store and asked the salesperson what kind of plant I had, showing her the picture. She picked up a book and turned through a few pages and said "Billbergia vittata." Then she picked up another plant and said, "This plant is related to yours — they are bromeliads." 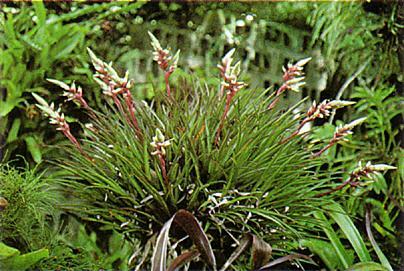 The plant was Tillandsia cyanea. I bought it on the spot. Now I have over 60 bromeliads. I have been interested in plants all my life. At the age of thirteen I became interested in hibiscus. I started collecting varieties and species that had arrived in Hawaii and also those native to the Islands. Looking over hedges of Hibiscus rosa-sinensis, the red flowered species from China, I observed many mutants, from dwarf flowers to overly large ones, variegated and bronzed leaved ones, etc. All became separate clones when planted in the garden, maintaining their differences. Similarly the native white flowered species were found to be quite variable when raised from seed. The variations in flower production and fertility of seed were factors I did not expect, but their use in making many hybrids became very worthwhile. It was at this time that I also found out how important it was to have certain individuals as females to pass on the good traits. The reversal of the cross was even more startling. Many other plants that were greatly expanded by asexual reproduction to make hedges were also observed to mutate. These mutants were always where conditions were good and rapid growth resulted. The sugar canes of the early years of the industry were plants secured from the wild or from native villages in many tropical areas. The canes that the Polynesians brought to Hawaii around 600 A.D. were mostly highly colored striped stem varieties that had long been associated with their cultures in religious rites. These early Polynesians had been good observers and realized that these striped varieties mutated to solid colored stalks and then mutated back again to striped, even striped of less intense colors. The Polynesians even had names for all the types of mutants. These first canes brought to Hawaii were soon expanded by mutation to six or seven times the number of forms. The commercially grown varieties and even their seedlings gave rise to many mutants because here was a crop being rapidly expanded by cutting up the stalks and planting the pieces. The citrus industry in Southern California started a project called "Bud Selection" that recognized the superiority of mutants of branches that were superior in yield and fine quality. The trees were top grafted to the scions of the better selections. A great increase in yield resulted from this initial move as all inferior or degenerate mutants were thus removed. The sugar industry of Hawaii undertook a similar project and soon proved that mutants yielding 25% more were to be found in any variety that was grown. One plantation expanded six of these strains to cover their entire area in a few years and made a great increase in total yield. But the problem of continuous removal of degenerate forms, which are common, discouraged the continuation of the process. Newer hybrids of higher yield were coming along and seemed easier to work with. On top of that mechanization was the big push, and machines do not pick out better strains nor better planting material. Years of observation of nature all over the world besides growing, hybridizing, and studying all kinds of plants besides orchids and bromeliads soon showed me that mutations are the way of life. It is how evolution takes place. The more stable the environment the greater the variation in a species, and the less stable the area the fewer the variations. Several researchers have published fine articles on this subject. It became clear that to obtain mutants one had to give them the very best culture that they desired, not just what you thought was needed. Good observation in native habitats obtains this information. But questions arise as to just what is a species, especially if it can vary to the point one could almost describe the mutant as a new species. Consider the records of what happened to plants from the great climatic changes in our past and note great periods of expansion as conditions became good and great periods of loss when conditions became bad. It was a constant change and a fight for survival. This goes on daily in our midst and it is the basic force in evolution. Not one single environment remains in any one spot forever; there is continuous change even if man never appeared on earth to aid in pollution and destruction of species these changes would continue. It is in this process that mutants arise that can better survive, and save the species. Take the bromeliads and ask why some species, for instance Nidularium innocentii, from the cloud forest of southeastern Brazil, should have so many variations. These are five color variants listed in Victoria Padilla's book and there are more when you recognize gigas and dwarf forms of each. Who would believe that var. innocentii with its purple leaves and great stature was the same species as var. viridis in green or lineatum and striatum with their green and white? As soon as they flower you see the same exact flower head and must realize they are one species. But we see this species at a period of change. Do you realize that in the same environment where Nid. innocentii lives grow epiphytic orchids that have greatly mutated to gigas sized flowers? Is there something in the environment or the granitic rock hillsides that induces mutation or is it just the nature of the genes within the plant species living there? I favor the effect of environment on the genes over their being anything inherently different. Take Aechmea chantinii from the Amazon and consider all the lovely variants with cultivar names that have recently come out of that area. One of the dark brown and grey barred forms growing at our front door produced a leaf with a 1 cm. wide green stripe down the length of the leaf. The brown color had been lost. The next "keiki" from the plant was right on that stripe and came out entirely pale silver green all over, not just partly one and partly the other. The plant is double the size of the dark leaved one. This is A. amazonica, so you see how deceptive some mutants can be in looking like different species. This mutant has only half the intensity of green and silver that is in the average chantinii and suffers from sunshine. Flowers of all forms of these chantinii are just about the same. Think of all the many forms of Tillandsia fasciculata and remember they come from a very wide variety of environments. Is it any wonder that they vary? As I write in February the "alba" form is in full color of fiery orange and yellow instead of shades of red. It was given to us as an alba form, but it has vibrant colors far from white. How many forms have you seen of this species with short to long flower spikes, short to long leaves, etc., with so many very dull and uninteresting heads of bracts and dull flowers? T. juncea is just as variable with red bracts to purple ones, big plants and little ones. However, some other species seldom change and just plod along producing the same type of growth over and over again. It just may not be their turn to mutate. There might be something in their make up that never allows them to vary. Have they gone through the "explosive" stage and reconcentrated and lost their ability to vary again? Maybe they have come from areas never subjected to change and built up a dominance against change? The next time you observe an especially fine form of a plant look to see if it is just well grown or whether it has within its genes the vigor and character of greatness? Look for these outstanding plants for they thrive on the care you give them, while the run of the mill form barely exists. Remember these traits can be used to your advantage while enjoying the plants' vigor. They deserve the space assigned to less vigorous or less floriferous ones. These fine plants just do not occur everywhere so be on the lookout for them. Lest you get the wrong idea from my comments, I am just as favorably impressed with vigorous small growers that give distinctively different reasons for their space in the sun. Consider the beautiful bronzed leaved Guzmania lingulata var. minor of small size, compactness of growth, and fieriness of flower color, and realize this mutant should have space in the garden. But I judiciously place these various species so their fine qualities will best show and always in the environments they need. Maybe mutants will appear. Look for them. Sixty-seven years after what was discussed in the first paragraph, I still look back at how enjoyable it has been to see plants mutate. What fond memories one can bring up at a moment's notice of things one has seen if one has a photographic vision as I am lucky to possess. But it worries me that the finest spots in nature where environments and location are perfect for mutation and evolution are so lightly regarded and unprotected. These should be capitalized upon, studied, and protected, and given national or even international recognition as places of great stature. These environments are in need of greater consideration and protection than most of the endangered species of questionable value. If we study these areas we may learn to duplicate their "secrets" and save this world. Remember that most of the mutants are a loss of some feature of the plant or the reacquiring of it, but the gigas forms are probably a doubling of the chromosomes. P.S. A marvelous specimen of Aechmea chantinii 'Pink Goddess' grows by the front door and developed a silver green stripe down the middle of one leaf. The tissue in the stalk from which the next keiki came out formed the typical A. amazonica form in its entirety and not as a chimera of both. Then from the stump, way below, came two plants, one of the 'Pink Goddess' with its brown and grey leaves and one of the regular dark green and silver of the typical chantinii. Now all three grow on one stump. A visitor the other day said it does not matter which one of these plants seed all three forms appear in the offspring. This I would like to see for it is a rare thing in plant life. Usually, I print the names of bromeliads in articles that appear in the Journal just as they are submitted. Recently, however, I have noted confusion on the part of growers as to the use of the terms cultivars and variety, with the consequence that a number of errors have appeared in the Journal. A cultivar (cv.) is a variety found only in cultivation; a variety is a botanical term used to describe a plant found in nature or in the wilds. To write the name of a botanical variety, you write the name of the genus, the species, and then the abbreviation var. followed by the name of the variety; for example Aechmea distichantha var. schlumbergeri. Growers should consult the International Code whenever in doubt as to the correct naming of their plants. While maintaining a collection of several hundred tillandsias, I am always on the lookout for new ways to mount the plants. So many visitors to my greenhouse have admired one specimen, that I have decided to write about it. The Cholla cactus, or "Arizona Cactus" as it is called in Louisiana, is picturesque material. My tillandsias are housed in an orchid greenhouse; consequently the atmosphere is quite humid. The cactus usually rots or is covered with mildew. 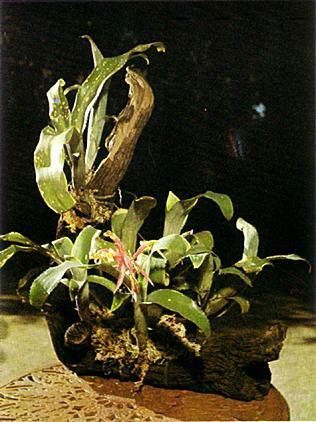 The wooden baskets used for vandaceous orchids formerly rotted in 14 to 18 months. Now they are treated (soaked) in a "Celcure" solution and apparently will last indefinitely. "Celcure" is the registered trade mark for acid cupric chromate and protects against rot, decay, termites, and other wood-boring insects. 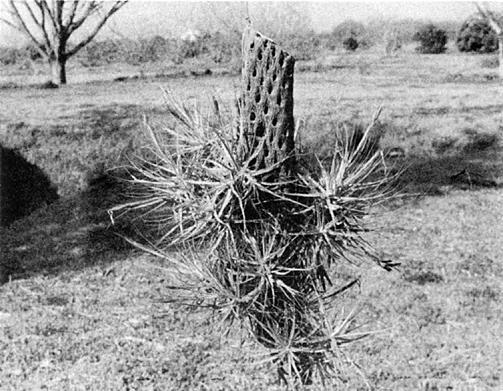 The same method was tried on a section of three-inch cylindrical Cholla cactus. After soaking for three minutes in full strength solution, the cactus was allowed to dry and on the third day the excess material was washed off. The plants, in this case Tillandsia schiedeana, were bound firmly in place with monofilament fishing cord. A single wire was used to hang the log, so the specimen could rotate with any movement of air. The log is now four years old, the material has hardened and now resembles petrified wood. All my plants are misted lightly frequently, and once a month are given a light misting of Peter's 18-18-18 water soluble fertilizer. Louisiana State University, Port Sulphur, La. Growing bromeliads on trees has always fascinated me. I suppose I am fortunate to have many lovely natural trees on which to grow them; but if you haven't a tree, don't despair, because you can always fashion one, usually from the prunings and castoffs from your own or other people's gardens. I have spent many pleasant hours fashioning my portable bromeliad trees. My very first effort has always delighted me and was one that was planted wholly with Vriesea carinata. It is beautiful at all times, but when in flower, it is a specimen of sheer delight and of a size that can easily be taken to the living room or to a show for display. An interesting piece of driftwood picked up on our beach, provided a good home for Billbergia leptopoda; this again is easily portable and is a most attractive addition to any living room or patio. Interesting branches from fallen melaleuca trees (native to this area) are ideal subjects for bromeliad trees when set in terra cotta containers with cement; attractive pebbles pressed into the half dry cement provide an attractive finish. Positioning the plants is very important, and it is best to try them in several positions before finally securing them. There are several things to remember at this stage, i.e., choosing reasonably hardy bromeliads and keeping in mind the size of each one when mature. Billbergia 'Santa Barbara' has been an ideal choice, moderate size with attractive coloring. 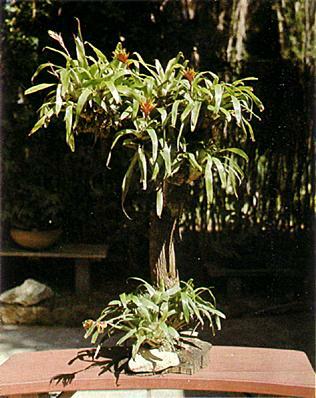 A large plant, such as Billbergia vittata, would be quite out of place on such a tree. There are many lovely plants from which to choose and the forming of your tree becomes something of an exercise in floral art. When all is ready, tie the plants very firmly in position with a pad of sphagnum at the base of each. Nylon stockings cut in ½-inch strips make ideal ties. Be very sure to secure each plant firmly. The finished tree can then be placed in the bush house, verandah, or sheltered part of the garden, where gentle rain and dew can reach it. The plants can be fed by foliar feeding with any good soluble fertilizer at ¼ strength to maintain good growth, but I have not found it necessary in my conditions. Don't be afraid to try this method of culture; after all, the bromeliads grew like this long before pots were invented; and, too, you will have the advantage of being able to move your tree out of the bad weather whenever it comes along. The vrieseas shown in color on the two succeeding pages well exemplify the great diversity to be found in this genus. Although usually considered rather fragile, vrieseas are for the most part rather easy to cultivate and generally are reliable bloomers. In southern California they do well outdoors along the coast and in protected areas. The vrieseas illustrated are all obtainable at nurseries. Vriesea 'Rose Marie' is a comparatively new cross made by De Roose of Evergrem, Belgium. Evidently the best of both parents — V. 'Viminalis Rex' and V. carinata are to be found in this hybrid, for, according to George Kalmbacher of the Brooklyn Botanic Garden, its inflorescence is one of the most beautiful in the entire family. V. flammea (not to be confused with the hybrid of the same name) is a robust species resembling a tillandsia in its habit of growth and general appearance. This native of Brazil generally does not flower until it has formed a good-sized clump, and then the display is a captivating one. V. chrysostachys is a native of Colombia where it was collected by Clyde Harris of Florida in an area southeast of the town of Caqueza growing on a steep out-cropping of rock. This species is attractive because of its soft green foliage and yellow-lemon colored spike, which lasts in color for several months. The plant is about thirty inches in height. Like Vriesea splendens it puts out new growth usually only from the base of the old inflorescence. Although it is listed among the species, V. retroflexa appears to be a natural hybrid between V. psittacina and V. simplex or V. scalaris. Its brilliant inflorescence, about 8 inches long, starts out as a pendent spike, then abruptly turns upward, making a graceful curve. Both V. 'Vigeri' (V. rodigasiana × V. 'Cardinalis') and V. 'Poelmannii' (V. 'Gloriosa' × V. 'Vangeertii') are old-time favorites, having been produced by that master hybridist Leon Duval. Both are medium-sized plants with soft green leaves and striking inflorescences which last and last. 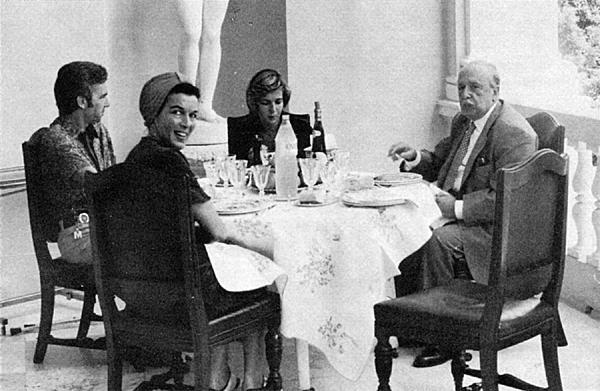 At luncheon — From left to right Marcel Kroenlein, Director of Les Cedres; Madame Marnier; daughter, Jacqueline; and Julien Marnier-Lapostolle. 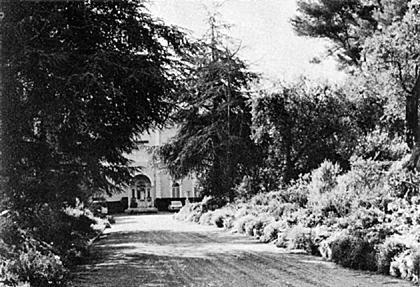 Left — Entrance to villa showing the Cedars. Julien Marnier-Lapostolle died unexpectedly on February 18, 1976. With his passing the world lost one of its most renowned experts on tropical and subtropical flora as well as an outstanding lover and collector of plants. But in the field of botany he will not be forgotten, for more than two dozen plants have been named in his honor. He was well known all over the world not only because of the famous liqueur "Grand Marnier," but even more so because of his botanical garden Les Cedres. Together with his brother he continued the family tradition of producing the world renowned liqueur, which gave him the financial basis on which to build the most famous privately owned botanical garden, located on Cap Ferrat, near Nice in France. Whenever botanists were on the lookout for certain rare species, they were sure to find them in Les Cedres. The only exceptions were tropical orchids, as Marnier knew only too well that these would never survive the climate of Cap Ferrat, and there was nothing more hateful to him than to kill plant life. His great love were cacti, other succulents, and bromeliads—and he possessed the most complete collections of these plants in the world. Marnier was very generous in financing many botanical expeditions, which, at the same time, brought him many rare plants. He inherited his passion for plant collecting from his father, who had obtained the estate of King Leopold II of Belgium. Centered within the 35-acre property stands the chateau, which allows an unbelievable view of the beautiful bay of Villefranche and the Riviera resort of Beaulieu. Behind are steep limestone mountains where high up the quaint village of Eze is visible. His father started to enrich the grounds by planting rare trees and building a large pond where he cultivated the Amazon waterlily Victoria Regia. 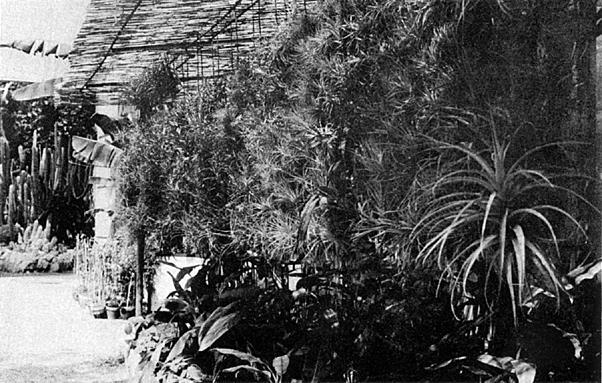 Another addition was the so-called "Tropicarium" containing a large variety of palms and treeferns. But it was Marnier was established a true botanical garden, erecting hothouses and shade sections for more difficult plants. The garden was named Les Cedres, after the large planting of cedars which line the entranceway to the chateau. Marnier gradually retired from the family enterprise, leaving the responsibilities of business to his brother, who was not so enthusiastic about horticulture. 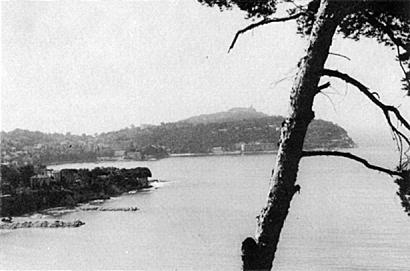 For most of the year he resided in Cap Ferrat. From ten o'clock in the morning he would spend the entire day in the gardens working with his gardeners. Although the gardens were not open to the public, plant enthusiasts and horticulturists were always welcome. It was a great pleasure for Marnier to chat with special guests who were interested in his favorite plant families. He liked to discuss plant problems for hours on end, sitting on a bench shaded by treeferns or palms as a protection from the hot Mediterranean sun. Marnier's fame was due not only to his famous gardens, but also to his great horticultural library, encompassing all available literature on botany and horticulture. He also established a nearly complete collection of photographs, showing all the plants in his gardens in flower. 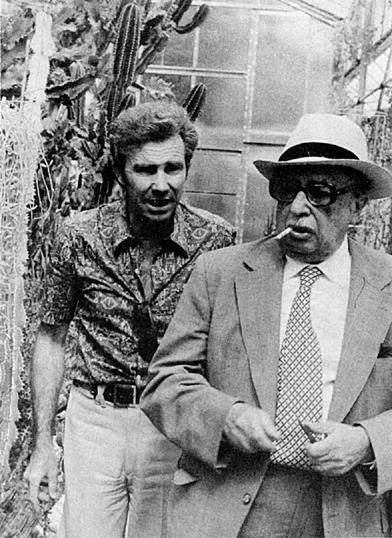 But, aside from his family, Marnier's interest was concentrated on his plants. Two small episodes illustrate this. Some years back an unusually strong frost hit the Riviera and the treeferns as well as many palms "let their heads hang way down." The author on this day met a completely broken Marnier, who was crying over the plant damage as if he had lost one of his closest relatives. 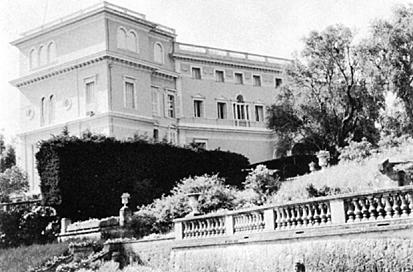 At another time, in March 1970, the author arrived at Les Cedres just as a part of the chateau caught on fire, damaging many very valuable paintings, tapestries, and rugs. Marnier was not disturbed by this severe loss, being happy that nothing happened to the library or to the plants. The director and the owner confer on procedures. A path through Les Cedres showing bromeliads growing on the trees. In spite of his great wealth, Marnier was ever a modest, amiable, and charming man. It did not bother him to dine in a small restaurant or a modest flat—on the contrary, he deplored ostentation. During the last year of his life Marnier was deeply concerned about the fate of his garden after his death. However, he need not have worried for Mme. Susanne Marnier, his wife, and their children have agreed to continue with the gardens in the spirit of Julien Marnier. Julien Marnier-Lapostolle received many honors in his lifetime: he was a Knight of the Legion of honor, corresponding member of Le Museum d'Histoire Naturella de Paris, Honorary Member of the University of Heidelberg, Honorary Trustee of the Bromeliad Society, to name just a few. The family of Marnier-Lapostolle plans to carry on with the botanical garden in his memory and to maintain the same staff who have been so devoted to him in the past in order to keep this very special achievement of horticulture excellence for future generations. What a wonderful thing this is for horticulture! The collections are unique in their completeness. We all know that with the constant deforestation going on throughout the world decimating the natural habitats of so many plants, forests everywhere are giving way to farmlands. At Les Cedres the various collections which include so many rare plants are sure to have some plants that may well be the last remaining examples of that species. His collections are strong in species of plants originating in what were once French colonies. These countries are today some of the most devastated. It is to be hoped that somewhere among the young horticulturists in training that there will be some enthusiastic young persons coming along who have the same deep positive love for systematic collections of living plants. The study of these living plants is now becoming more and more important as scientists are learning that the life circle of a plant cannot be learned from an herbarium specimen; so as we find the need to know more about these living plants, the life work of Julien Marnier-Lapostolle and his family's beneficial decision to continue the garden will become more and more important. FROM FLORIDA — In Florida we are lucky to be able to purchase three cubic foot bags of cypress mulch. This is cypress bark and wood chips ground up in a mixture that is excellent to handle and makes a fantastic potting material for aechmeas, billbergias, neoregelias, and quesnelias. The new root growth is unbelievable. We mix it as follows: 2 part cypress mulch, 1 part Canadian peat, 1 part sand or perlite. While the community pot for orchid seedlings has been a longstanding procedure, we have found this to be a good technique for other slow growing plants. It has been particularly successful with bromeliad seedlings. The tiny plants are transplanted from the seed flat to a four-inch pot filled to within an inch of the rim with our bromeliad mix. A dozen or so seedlings are placed in each pot and a small pane of glass laid on the top of the pot. The pots are placed within 9 inches of a large battery of 40-watt cool white tubes. In this warm, humid communal atmosphere the seedlings seem to be very happy, and by the time they are pressing against the glass, they are ready for their own two-inch pot. The first prize, a gold medal from the Massachusetts Horticultural Society, was won by the New England Bromeliad Society for "a group of bromeliads." That's what I learned at the 1976 Spring Flower Show at the Commonwealth Armory, in Boston, Massachusetts. The society was founded in 1972 and after only four years was able to mount this prize-winning exhibit. The president now is Warren Schwartz. It has about thirty active members, and they certainly deserve credit for their beautiful and interesting collection of plants at the show held this March. Among the rare and interesting plants I noticed the following: Vriesea gigantea 'Nova. ', the Guz hybrid Guzmania 'Symphonie,' Guzmania zahnii 'Omer Morobe', Orthotanthus 'What', Vriesea fosteriana 'Red Chestnut', and Aechmea lasseri with deep red leaves. In full bloom was a Tillandsia duratii var. decomposita, a drooping form. Your reporter from New York was much impressed by the New England Flower Show and wishes it every success. For a couple of years now, I have been growing vrieseas and guzmanias glued onto wood, cork, hapuu, etc., with very gratifying results. I know other people are doing the same with good results. What kind of glue do I use? Any kind! But for your own safety, be extremely careful if you use "Super-Glue." If you get it on your skin you are in trouble. I've used "Elmer's Glue" to "Paper Cement" to mount the plants, but making sure never to put any glue above the roots, touching the leaves. Leaf burn—No! Root Burn—No! Rate of growth—Beautiful! I've experienced some problems with the guzmanias, however—sanguinea—slow growing and musaica—no growth at all. But that might be due to some poor light conditions in the house. I think the secret of my success growing bromeliads in my home is "moving air." I have small fans going at all times. Thus the plants have a chance to use up the water within 24 hours. Small seedlings, will keel over if they do not have a chance to dry out every 24 hours. 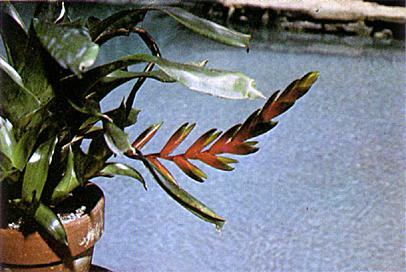 The larger plants become less particular, but all bromeliads need a good constant breeze. As the Palm Society ads in our Journal say "Palms and Bromeliads grow well together". Of course they all grow well under palms in or out of pots, but I like to leave long boot stalks on my cabbage palms to put potted bromeliads in and hang Tillandsias onto them. This way one palm can shade a large number of bromeliads, from the ground up. In Brazil I saw a very good use for dead palm trunks. The one used was about ten feet tall, had interesting markings on the rough trunk, was cut in half longways and fastened to the stone wall of a house. A fern was planted on the top and several were fastened to the sides. A palm with boots left on could hold a number of bromeliads. Some palms hold their boots for years and others have very interesting markings on the bare trunk, as the Phoenix group or the Butias. In Orlando I have seen a bare cabbage palm trunk with an iron spike driven up into it, then it was set in cement. They were used in groups of different sizes and plants were fastened to them in fiber filled screen pockets. A number of bromeliads could be fastened on without pockets. The big pot-like bases of cabbage palms make good planters, after the palm trunk is removed, of course. Chunks of palm trunk with holes dug into them make long-lasting planters. 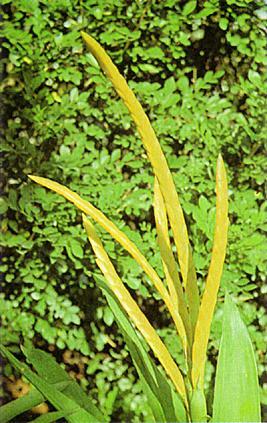 "Lethal Yellowing" disease had killed many palms in Florida. Perhaps after disinfecting their trunks could be used. Those who grow outdoors, even just during the warm weather, soon realize that their plants are subjected to damage from strange sources. These can range from the eccentricities of Mother Nature's moods to destruction by pets or to the "damage" created by thieves. The current popularity of plants has also increased their vulnerability to this latter type of predator. But these are not the only sources which can cause damage. There are other animals and, of course, insects. After my experiences last summer, I feel that I may almost qualify as an "expert" on damage done to bromeliads by grasshoppers and squirrels. With only very little more "research", I could perhaps present a paper entitled "Preferences of Grasshoppers in the Bromeliaceae". For several years, I have noted some damage to my bromeliads caused by grasshoppers but the past summer was the worst. Surprisingly, there did not seem to be an exceptionally large number of these aggressive insects and yet, the damage they caused was appalling. Each morning, an inspection of my bromeliads showed the ravages of the previous night. And most of the damage did occur at night. On a whole, the hungry 'hoppers seemed to prefer the tough-leaved bromeliads. Their favorite of favorites was Quesnelia testudo. This specimen, which consisted of a large plant and one medium sized offshoot, was riddled. Hugh hunks were eaten from nearly every leaf and the tips of some leaves were left hanging by a thin center strip resembling a leaf midrib while this "midrib" was all that was left of some leaves. In only a few nights, this plant was an ugly mess. In addition to this quesnelia, the 'hoppers concentrated mostly on the neoregelias, some aechmeas and a few billbergias. With the exception of one small bite out of a Vriesea guttata (just a sample taste? 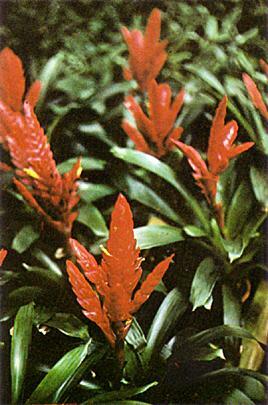 ), the soft-leaved bromeliads were passed by entirely. Strangely, the Neoregelia marmorata hybrids with their lovely spotted foliage had very little damage while adjacent specimens of Neoregelia spectabilis, N. johannis and N. carolinae var. meyendorfii showed heavy damage. The location of the plants did not seem to contribute to their disfigurement. Even the undamaged vrieseas, guzmanias and low-light aechmeas (A. 'Perez' and A. 'Royal Wine'), while situated in a different area from the heavily damaged tough-leaved plants, were next to a large schefflera plant which suffered extensive damage. Nothing seemed to stop these insects so in desperation I began making surprise nighttime inspections with a flashlight. By carefully going from plant to plant, I could find some of the culprits. Usually they were hungrily "chomping" on the foliage but sometimes they were hiding deep in the cups. Holding the light, stepping between the pots and attempting to catch the invaders took some practice. (It also took some explaining to the neighbors!) But I was able to capture and execute some of the enemy. After several nighttime raids, the damage decreased sharply. Perhaps I should add that the plants were in pots on the ground or elevated no more than two feet off the ground. For quite a few years now, squirrels have been damaging my bromeliads. Usually this damage was confined to those plants hanging in pots and baskets from tree limbs and consisted of total destruction or the removal of most of the leaves. The two most popular with these little animals seemed to be Aechmea gamosepala (always shredded to a nub) and Hechtia lindmanioides (leaves chewed or torn off and thrown to the ground and also some damage to the roots). However, this past summer I encountered a new squirrel problem. About midseason, I began to notice that the center leaves of some of my bromeliads in pots on the ground were being badly slit. This type of damage was restricted to the wide spreading plants, mostly neoregelias, while the more upright bromeliads such as Guzmania 'Exodus' and Aechmea 'Foster's Favorite' had the entire basal area on one side shredded. This damage seemed to occur in the early mornings. I was rather puzzled as to what caused this situation until I noticed a squirrel drinking from a neoregelia and decided that he must be the culprit. Did he slit the leaves in an attempt to get water? I decided yes. But why? A birdbath close by was kept filled with water. However, I placed a container of water on the ground in each area of heaviest damage. (The damage was almost completely restricted to two small but separate areas.) After this, no new slitting was observed. I can only assume that this particular squirrel (or squirrels) was just too lazy to jump onto the birdbath although I had often seen squirrels drinking there before. So, while growing bromeliads outdoors may give wonderful colors and shapes to the plants, it is an open invitation to every type of insect and animal (including humans) to "do their thing" to damage, destroy or remove your bromeliads. So be on guard day and night! Arm yourself with any thing that may help defeat the destroyers and predators. Today 'hoppers and squirrels; tomorrow, scale! Although the temperature dropped to a low 28° several nights this winter, and we had unheard of "snow" in southern California, I found a number of surprises in some of the bromeliads that wintered outside. The following were grown under 63° shadecloth with no other protection. Aechmea — 'Bastantha' — good growth and excellent color with no damage. dactylina (small form) seedlings — good growth with some very slight damage to edges of some of the leaves. eurycorymbus — good growth and better color in leaves than plants grown in greenhouse. No damage. orlandiana var. 'Ensign' — No noticeable difference between growth and color from plant of same size grown in the greenhouse, however the plant growing outside has a more upright leaf structure than the greenhouse grown. sphaerica — seedlings — Growth habits and color much the same as plants of same group grown in greenhouse. Those outside seem to have "harder" leaves. Billbergia — pyramidalis 'Kyoto' — Grew a little slower outside than in the greenhouse, but no other noticeable difference. Vriesea — barclayana, barilletii, fosteriana 'Red Chestnut', 'Kitteliana', malzinei and philippocoburgii var. philippocoburgii. These plants all grew well outside and the color in the leaves is fantastic. Most of them are coming into bloom now, whereas the same plants in the greenhouse show no indication of blooming at this time. Your "Micro-climate" is your garden temperatures, light conditions, and humidity. If you know what it really is, you will be able to grow your bromeliads with less trouble and greater success, but it does take a little time and study. To give you an idea of how to go about this, I am going to tell you how I did this myself a few years ago. My garden was a concrete patio 13' × 23', fenced on two sides and bounded by an apartment building on the other two sides. After growing plants in this space for several years, I knew where the sun hit during the different seasons, so I felt that I knew where the warm and cold spots were. But because some plants were not doing so well as they should have been, I set out to discover why. I purchased a maximum-minimum thermometer, placed it in the garden and began to watch the temperatures. After several months of watching and recording temperatures and moving the thermometer around the garden, things were not looking at all as I had expected. I then set out to do a more thorough study. I purchased a second maximum-minimum thermometer. Both thermometers were placed in the garden in different locations. I noted these locations on a large calendar on which I also recorded the temperatures. Every morning when I watered or checked my plants I recorded the maximum-minimum temperatures on the calendar day squares and brought the "floats" down to the present temperature. After three months the thermometers were relocated, new locations noted on the calendar, and recording continued. At the end of one year I had a pretty good picture of my garden's micro-climates. The temperatures in my tiny garden area varied as much as 10° F., and it was easy to see why some plants had thrived while others had not. At the end of the recorded year I placed one thermometer in the coolest spot and the other in the warmest, to keep a check on my micro-climate. Then I moved plants around to conditions I thought would suit them best. I also bought and started using a wet-and-dry bulb thermometer to keep a check on the humidity. My plants prospered and so did I. The broms more vigorously, colored up better, and some were not shy bloomers anymore. I was able to care for them with less time and more confidence, leaving me more time to collect and care for more plants. JOURNAL OF THE BRITISH BROMELIAD SOCIETY — Published quarterly by R. J. Lucibell, Editor, Plant Biology, Queen Mary College, London El 4NS. Subscription is 2 pounds or the foreign equivalent, per annum, from the first of April. 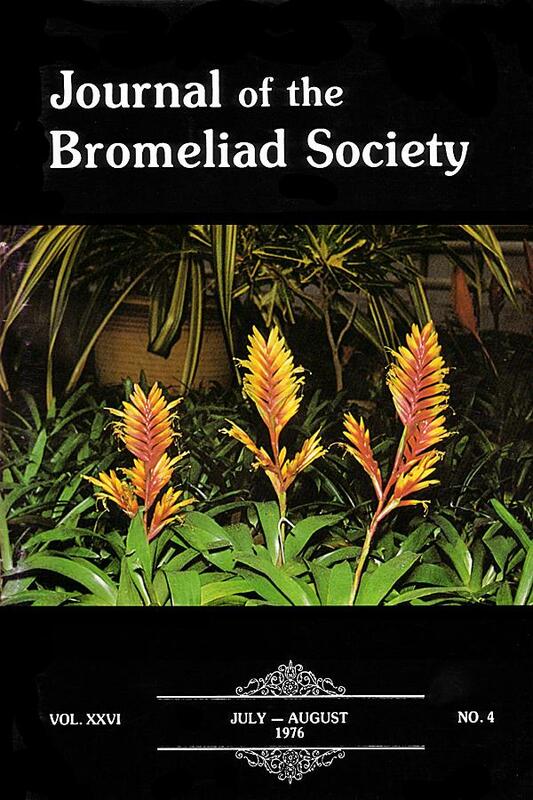 BROMELETTER, The Official Journal of the Bromeliad Society of Australia. Editor is Mrs. Olwen Ferris, Bromeliad Display Garden, 83 Pine Ridge Road, Paradise Point, Queensland 4216. Subscription for this bi-monthly bulletin is $5.60 in Australian currency. BULLETIN OF THE BROMELIAD SOCIETY OF NEW ZEALAND — Those affiliates desirous of putting out their own bulletins would do well to emulate this effort by the members down-under. It does not pretend to be more than a regional bulletin, but it is full of helpful material to those living in the area, and the many descriptions of gardens are fascinating. Our compliments to Mrs. Bea Hanson, the editor. Annual subscription is $4.00, by air, $5.00. Address is 279 Mt. Wellington Highway, Panmure, Auckland 6, New Zealand.